A revolutionary approach to smart metering technology, the modular design and communication architecture combining RF Mesh, G3-PLC and LTE technologies make the new Landis+Gyr E360 meter a future-proof solution ready for the IoT world. Utilities no longer need to choose and lock to a single communication media and fixed functionality set, but can instead adapt the device to meet the requirements of the future. The flexibility, modular design and long asset lifetime of the E360 deliver utilities exceptional value for their investment. The modular gateway design of the E360 enables any meter to become a gateway device just by adding a module, removing the need for separate RF collectors or PLC data concentrators. 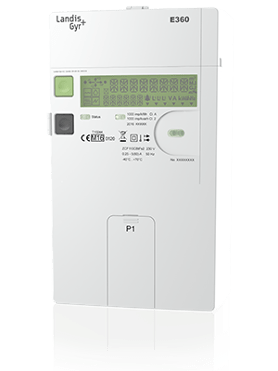 This provides a new level of flexibility in the communications network, as the meter’s role can be changed on-site just by changing the module, without even switching off the power or requiring an electrician, which greatly improves meter installation and rollout efficiency. The modular design and the remotely updatable, intelligent firmware platform of the E360 allow energy companies to flexibly adapt to the changes in the regulation, technology and utility’s business models. Integration costs are also reduced by the meter’s compliance with IDIS (Interoperable Device Interface Specifications) protocol. The E360 has been designed from scratch to follow the key principles of the Fair Meter initiative, ensuring energy, emissions, materials, safety of resources and circularity requirements are considered in all stages of the meter's lifecycle.